This is another view in the Forsinard area. The loch is on the edge of the Flows at the head of Strath Kildonan. A very peaceful scene with lovely colors and composition. Just beautiful! Not only a stunning painting, but the place is beautiful, too. Do you really live so far north? Just checked out the area on a map...so badly now do I want to visit. The car journey might be just too far and the train will take forever. I'll just have to sprout wings. Yes Sue, you can't go any further north without getting your feet wet! This is a great area I have been looking at photos of this area on the internet, looks very peaceful. It is years since I drove through Sutherland. 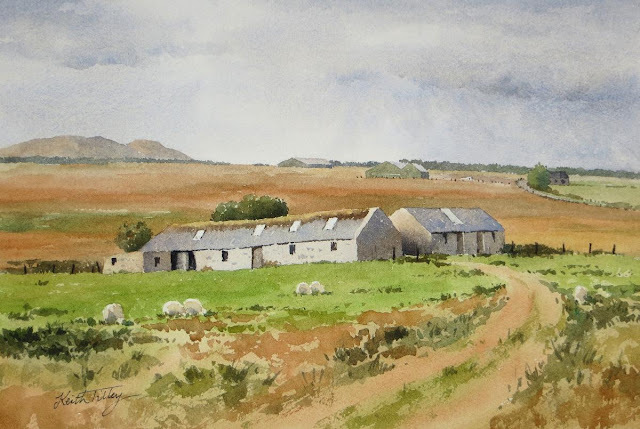 Your painting really captures the light and the atmosphere of the place, delicate watercolour painting yet full of mood too. 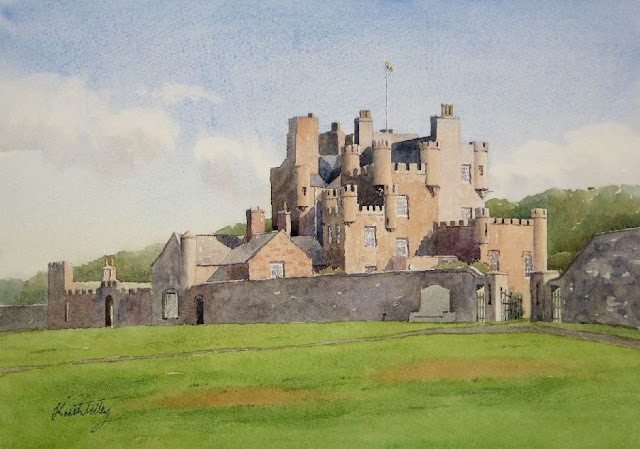 Did you paint this from a photos, I quite fancy having a go at painting this area once my paperwork and preparation work for my class is over with. Yes Caroline it's really quiet. The road and railway follow the same route through Strath Kildonan, and the scenery is beautiful, in a wild way. Strathnaver is the same. In fact the two straths could be connected in a good circular route from Tain/Dornoch. I painted these last two from sketches. I had a walk up Ben Griam Beg and got a few good sketches that day. 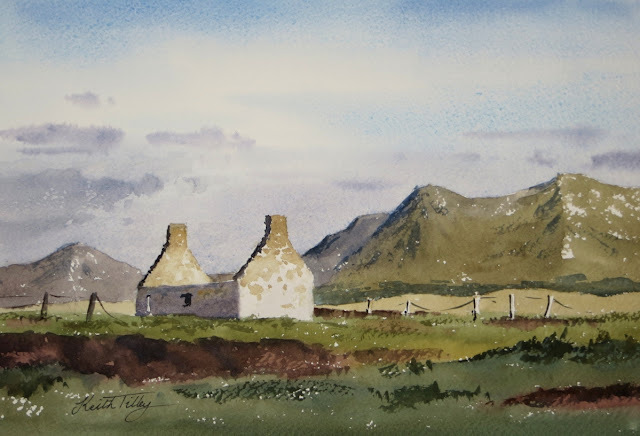 I think you would certainly find some good subjects for your style of paintings in central Sutherland. I'm considering doing something with a Sutherland theme, myself, for the Elgin exhibition. It's the tones that work so well in this one. The limited pallete is superb but the tones bring it to life. I love that sky. Masterfully simple. Thanks John, getting the tonal values right can certainly make all the difference to a painting. Hi there Keith!... Your reverence and affinity for wild places is always present in your broad...vast... sweeping... and empty-of-human presence panoramic paintings! 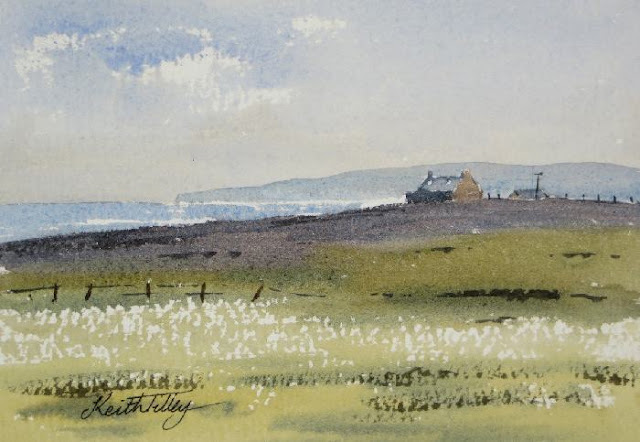 This one beautifully captures the earthiness of the peat... the constant presence and importance of water... on the land... and from the sky... it's all present in this lovely painting! Well done! I'll look forward to seeing more! 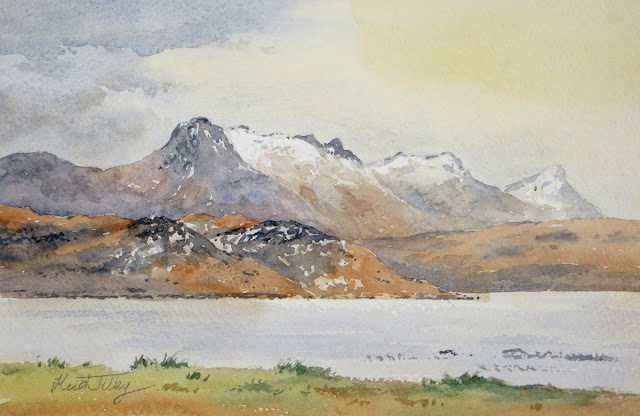 Hi Bruce, it's certainly true that wild places are where I'm most at home, and that must come through in the paintings. Beautiful painting Keith with lovely fresh juicy washes! Hi Keith, I know you mentioned you had some ideas for the Elgin exhibition and I think the two paintings would look lovely there. I think it's definitely going to be something with a Sutherland theme, Caroline. Thanks Ingrid. I don't think the Tourist Board grab anything with two hands!